An interesting day on the usd to cad daily candle chart yesterday, with the currency pair finishing the day with a long legged doji, indicative of indecision and therefore a possible turning point. 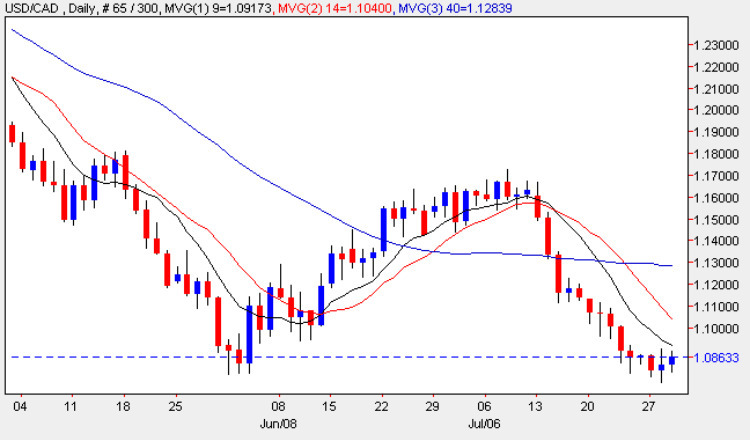 What is particularly interesting about this candle is that the low of the day is precisely aligned with the lows of early June, from where we saw a sustained rally take place moving the pair from 1.08 back to re-test the resistance in place at the 1.17 level, before stalling and finally reversing sharply lower. Whilst we may not see a complete re-run of this price action, the fact that we have a doji at an identical level should be a warning signal that the sharp decline of the last two weeks may have come to an end, and that the US dollar bulls are about to take control once again. Clearly this is unlikely to happen overnight, and with all three moving averages still weighing heavily down, then we will need to see these breached initially before any sustained move higher could be considered as any longer term reversal. It may well be that this will simply be a pause point before moving lower once again, however for longer term trend trading I would suggest tightening up stops and possibly taking some profits off the table before being caught in a short squeeze higher. The first test of any upwards move will come at 1.10 where we now have a minor resistance level in place, bit should this be breached then we could see a stronger move upwards, similar to that in June. There are several items of fundamental news due for release in the US shortly, and I have covered these for you in detail on the euro to dollar site. With no news on the economic calendar for Canada today, the only item of significance of the Canadian dollar will be the oil inventory figures, which as always will have a greater impact on this currency that the US dollar.